Another article that supports the now headlining evidence that taking a Vit D supplement is a good idea. Vitamin D is understood to be one of the most important nutrients required for the body to function optimally and for an individual to be healthy. It is also famous as the nutrient our body can absorb simply through exposure to sun. A deficiency in this essential vitamin can have many negative consequences, and has even been linked to hair loss directly and indirectly. The negative impact of a vitamin D deficiency on the body can lead to conditions that cause hair loss as a secondary symptom, and there is evidence to suggest that vitamin D is directly involved in supporting the process of hair growth and hair follicle health. NEW QUIZ: Why not to my new 6 question quiz (found at the bottom of this article) which will show you how easy it will be for you to reverse your hair loss based on the answers you give. UC Berkley Wellness provide recommendations on the optimal level of vitamin D in the blood, which is admittedly still argued about among experts. Levels of vitamin D are measured in nanograms per milliliter (ng/mL) and is determined through a blood test. Generally, an optimal level of vitamin D is at least 30 ng/mL, but some researchers advise having a higher level of up to 50 ng/mL. While there is limited agreement on what the most ideal level of vitamin D in the blood is, there is a wealth of research on the potential negative consequences of a vitamin D deficiency. When levels of vitamin D drop below 20-30 ng/mL, the body may begin to experience that deficiency and symptoms may begin to develop. The type and severity of symptoms vary from one individual to another, and can be fairly severe due to the important role vitamin D plays in a variety of bodily functions. Depending on the extent of the deficiency there can be a variety of mild to severe symptoms and persistent deficiencies may lead to more significant illness. When an individual is deficient in vitamin D there are numerous consequences on the body, many of which can lead to hair loss or thinning hair. A study from the Dermatology Online Journal discusses research on the role of vitamin D in hair disorders and the cycling process of the hair follicle. Vitamin D plays an important roll in the differentiation and proliferation of keratinocytes, and the researchers sought to further understand the role of vitamin D in the process of anagen initiation as it relates to hair growth. While the authors determine that Vitamin D does play a significant role in the process of hair cycling, they suggest that more research is required on the potential regulation of vitamin D to successfully treat hair disorders. Keratinocytes are understood to be involved in the development of epithelial cells which are required for healthy hair growth (See Fig. 1). 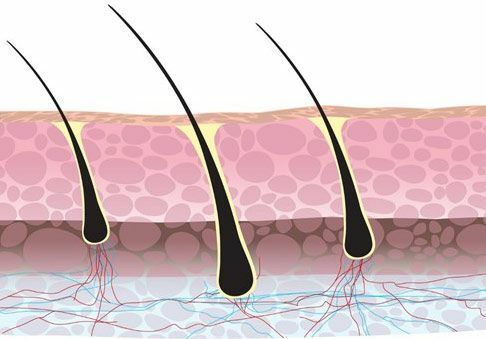 Earlier studies available from the US National Library of Medicine determined that the use of keratinocyte growth factor promoted the survival of the hair follicle. Ensuring that your body maintains appropriate and healthy levels of vitamin D is likely to support the processes involved in healthy hair growth at the point of origination. A study from the British Medical Journal also discusses the role of vitamin D in hair loss based on a review of the available literature. The majority of available information list numerous health concerns connected to vitamin D deficiency. However, this article does compare the science to the media message and states that much of the research do not take an explicit stance and recommends further study and scholarly debate. Another role vitamin D may play in hair loss is discussed in research from the Turkish Journal of Medical Science that measures the effects of hereditary vitamin D receptor deficiency on an individuall’s hair growth. This research determines that maintaining sufficient vitamin D levels in the blood reduces the likelihood of experiencing the effects of telogen effluvium. The study found that individuals that qualified for a diagnosis of telogen effluvium also showed a statistically significant difference in low levels of vitamin D in the blood. Telogen effluvium is identified as a very common cause of diffuse hair loss by the Journal of Clinical & Diagnostic Research, and is a commonly occurring autoimmune disorder. This condition is considered to be a period of hair loss following a triggering even, however there is the potential for chronic telogen effluvium to occur. There can be various forms of telogen effluvium, all of which effect a particular process within the hair follicle (S ee Fig. 2). The resulting condition includes thinning hair, brittle and unhealthy hair, as well as hair that is easily dislodged from the scalp. Fig 2. The 3 hair growth phases. Vitamin D plays significant roles in both supporting the physical processes related hair growth, and is more directly involved through the development of keratinocytes. If a body is dealing with a vitamin D deficiency any one of these important processes of hair growth might be interrupted and lead to issues of thinning hair and hair loss. Beyond these more direct roles, vitamin D levels can also impact the body and cause a variety of issues that may impact hair growth as well. The National Institutes of Health recommend ensuring healthy levels of vitamin D though the combination of diet, exposure to sunlight, and to only use supplementation if necessary. While there are numerous methods of addressing vitamin D deficiencies, it is possible to overdo the intake of vitamin D.
Any deliberate steps towards increasing the intake of vitamin D, or addressing a vitamin D deficiency, should be done in consultation with a medical professional. However, it is unlikely that you can get too much vitamin D from sunlight and dietary changes. The human body is able to absorb vitamin D through skin that is exposed to sunlight or artificial sources of ultraviolet B (UVB) radiation. While the absorption of vitamin D does occur with UVB exposure, the dangers of UVB exposure should be taken into consideration. Sunscreen does block much of the vitamin D able to be absorbed, but it does protect the skin from the damaging radiation. Here are some foods that are particularly high in vitamin D: cod liver oil, portabella mushrooms, fatty fish, fish roe, tofu, eggs (yolk) and almond milk. During the winter months, when the sun is low in the sky I would highly recommend taking a good vitamin D supplement. This will be especially important if you have darker skin as your body won’t be receiving the amount of sun that you’re used to genetically. Preparation: Preheat oven on broil. Combine the maple syrup, hoisin sauce, Dijon mustard, and ground black pepper into a small bowl and whisk until fully blended. Coat a broiler pan with olive oil and place the salmon on it with the skin side down. Brush the salmon with the maple sauce, coat generously. Broil the salmon until it flakes easily, approximately 10 to 12 minutes. Re-apply the maple mixture twice throughout the cooking. Preparation: Heat flour in small skillet on medium to high heat, stir constantly and cook for 2 minutes until flour turns light brown. Remove the flour from the heat and allow to cool. Place the porcini mushrooms in a bowl and add the boiling water, cover and allow to steep for 20 minutes. Strain the porcini mushrooms, making sure to sake the strained liquid. Once removed from the liquid, chop the mushrooms. In a Dutch oven, melt the butter and add onion to sauté until tender, approximately 5 minutes. Add the thyme, garlic, pepper, and salt and sauté for 30 more seconds. Add the shiitake mushrooms to the Dutch oven and cook for 3 seconds, making sure to stir constantly. Repeat with the button mushrooms. Add the porcini mushrooms and the broth to the Dutch oven. Combine the toasted flour with the strained liquid from the porcini mushrooms, stirring with a whisk. Add the flour mixture to the Dutch oven and bring to a boil, reduce the heat and simmer for 15 minutes uncovered. Add the milk and simmer for 10 more minutes, stirring regularly. Remove the Dutch oven from the heat and stir in the half and half and the sherry. Take 2 cups of the soup and blend, processing until smooth. Add the processed soup back to the Dutch oven and allow to warm on low heat. Sprinkle with fresh parsley when serving, if desired. There is enough available evidence to suggest that a vitamin D deficiency can have significant negative impact on the body, including hair loss, thinning hair, and unhealthy or brittle hair. Maintaining a healthy diet rich in vitamin D and getting a safe amount of sunlight will help ensure optimal levels, but some people may require the use of available vitamin D supplements. If you are experiencing hair loss, it may be useful to consult with a medical professional about testing for and potentially managing a vitamin D deficiency.